THESE first fifty pages contain a number of illustrations depicting primitive Indian life. Our knowledge of their conditions is obtained from the accounts of the early discoverers and missionaries, from objects found by digging the sites of their habitations, and from the later descriptions and drawings of white men who visited Indians living in primitive ways. Many features of their way of living are still uncertain, and it is impossible, in the present state of our knowledge, to give a complete picture of pre-historic Indian culture. The subject cannot be covered thoroughly within the limitations of space in a book such as this. For further details the reader should consult the section on Sources of Information. Illustrations will be included in later sections of the book depicting Indians during the periods of European settlement, when contact with the whites changed many of their methods of living. 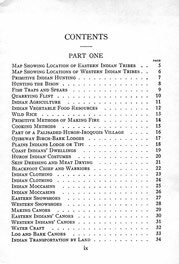 The Northern and Woodlands Indians were hunters and fishermen, having no settled habitations, though each tribe or group occupied its own vaguely defined hunting area. In addition to fish and game, they used wild fruits and berries and gathered wild rice for food. They sheltered themselves in wigwams covered with birch bark. In summer they travelled by the numerous waterways in canoes made of a wooden framework, over which were stretched sheets of bark or, in the extreme north, moose hide. In winter they used snowshoes. The canoe and the snowshoe are the masterworks of Indian handicraft. The Plains Indians were also nomadic hunters, depending largely on the buffalo, whose hide and flesh provided food, shelter and clothing, and coverings for their crude river-boats. Their shelters were teepees made of poles set together in the form of a conical tent and covered with buffalo hides. Before the white man came the dog was their only beast of burden, and it was not until the first half of the eighteenth century that horses, originally brought to this continent by the Spaniards, made their way northward to the Canadian tribes. Deer, antelope, wild fowl and fish, and above all, buffalo were their main food sources, though they also gathered berries and dug roots and tubers, especially the camas. The West Coast and Mountain Indians, though they were fishermen and hunters, lived in more or less permanent villages of houses made of logs and planks which they split and hewed with stone axes and wedges. The salmon that frequented their coasts and rivers were their staple food supply, to which were added shellfish, game, roots, berries and fruits. Their canoes were of bark-covered frame construction for inland rivers and lakes, and dug-outs made from the huge firs and cedars for sea-going voyages. These log canoes, some of which were of great size, were hollowed out by charring, and by gouging with stone and bone chisels and axes. With these crude tools they became expert carpenters and carvers. They also learned to weave textiles for baskets, mats and clothing, using root fibres, especially cedar, and the wool of mountain goats and wild sheep. In design and execution these Indians were probably the most skilful native craftsmen in Canada. The Atlantic Coast Indians were naturally fishermen, though they also hunted wild fowl, deer, caribou, moose, seal and bear for food and skins. They used both bark and dug-out canoes, and their wigwams were similar to those of the other woodland Indians. They developed some decorative skill in porcupine quill work and in painted designs on their skin garments. The Agricultural Indians of Eastern Canada occupied the territory south of the Laurentian country, including parts of the region of the present Maritime Provinces, the St. Lawrence Valley, and especially the neighbourhood of Lakes Michigan, Huron, Erie and Ontario. The earliest white explorers of these regions found the Indians cultivating corn, pumpkins, beans, tobacco, squash and melons. This agricultural development, though rudimentary, made possible a more settled and organized community life; and though their food requirements involved both hunting and fishing, the tribes of this area had progressed beyond the nomadic stage and lived in compact settlements and villages. 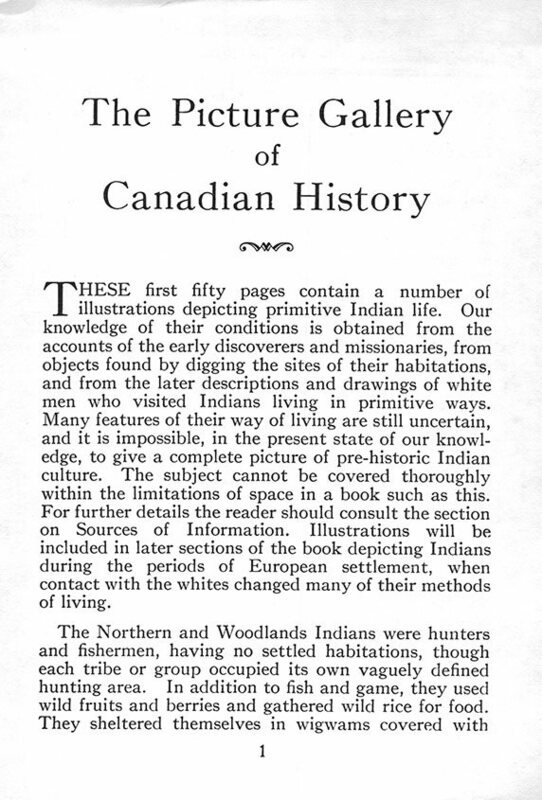 Community life among the Indians of eastern North America reached its highest development in the Iroquois Confederacy of Five Nations, living around Lake Ontario, their kinsfolk, the Hurons, between Lake Simcoe and Georgian Bay, and the Neutrals, in southwestern Ontario. 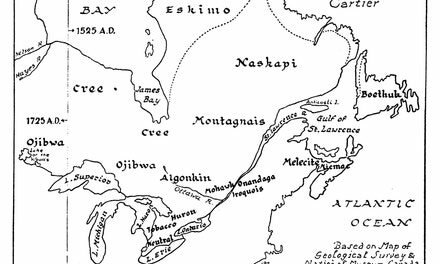 As tribes the two latter are extinct; but descendants of the Iroquois are settled today on the Grand River near Brantford and at Deseronto on the Bay of Quinte in Ontario, and at St. Regis and Caughnawaga in Quebec. The Eastern Indian tribes formed two main groups, speaking different languages: the lroquoian and the Algonkian.